Windsor Great Park is a Royal Park of 2,020 hectares (5,000 acres), including a deer park, to the south of the town of Windsor on the border of Berkshire and Surrey in England. The park was, for many centuries, the private hunting ground of Windsor Castle and dates primarily from the mid-13th century. Historically the park covered an area many times the current size known as Windsor Forest, Windsor Royal Park or its current name. The park is managed and funded by the Crown Estate. Most parts of the park are open to the public, free of charge, from dawn to dusk, although there is a charge to enter Savill Garden. The park is Grade I listed on the Register of Historic Parks and Gardens. Windsor Forest and Great Park is a Site of Special Scientific Interest. The Great Park is a gently undulating area of varied landscape. It has sweeping deer lawns, small woods, coverts and areas covered by huge solitary ancient oak trees. There is a small river in the north of the park called the Battle Bourne running to the Thames near Datchet. The River Bourne runs through a number of ponds to the south. Chief amongst these are Great Meadow Pond and Obelisk Pond, near the great lake of Virginia Water. The most prominent hill is Snow Hill and the avenue of trees known as the Long Walk runs between here and Windsor Castle. The area is accessed by a number of gates: Queen Anne's Gate, Ranger's Gate, Cranbourne Gate, Forest Gate, Sandpit Gate, Prince Consort's Gate, Blacknest Gate, Bishop's Gate and Bear's Rails Gate and the original medieval park pale can still be seen in places. The main road known as Sheet Street (A332) into Windsor runs through the northeast of the park. On the western side of the park is The Village, built in the 1930s to house Royal estate workers. It has a village shop and infant/junior school. Other buildings include the Royal Lodge, Cumberland Lodge, the Cranbourne Tower and Norfolk Farm. The park lies mostly within the civil parish of Old Windsor, though the eastern regions are in the Borough of Runnymede and there are small areas in the parishes of Winkfield and Sunninghill. Areas associated with or attached to the Great Park, but not officially within its borders include the Home Park, Mote Park, Flemish Farm, Cranbourne Chase, Forest Lodge and South Forest. The modern enclosed deer park is at the northern end of the Great Park. It is home to a large herd of semi-wild deer, reflecting the original medieval purpose of the park. The Long Walk runs south from Windsor Castle to the 1829 Copper Horse statue of King George III atop Snow Hill where there are impressive views of the castle. It is 2.65 miles (4.26 km) from George IV Gateway at Windsor Castle to The Copper Horse. Other equestrian statues in the park include one of the Prince Consort, to the west of the polo grounds, and one of Queen Elizabeth II near the Village. The Royal Lodge was built in the centre of the park as the Deputy Ranger's house. It was made into a retreat for the Prince Regent from 1812, but was largely pulled down after his death. The remains were renovated, in the 1930s, as a home for the Duke and Duchess of York before their accession as George VI and Queen Elizabeth. It is now the official residence of the Prince Andrew, Duke of York and not accessible by the public. The Royal Chapel of All Saints was built after the chapels of the Royal and Cumberland Lodges proved too small for growing numbers of household staff. The chapel was built in 1825 by Jeffry Wyattville and regularly used by George IV during the refurbishment of Windsor Castle. It was later remodelled in the Gothic Revival style by Samuel Sanders Teulon and Anthony Salvin. Queen Victoria often attended the chapel as did the Duke and Duchess of York before their accession as George VI and Queen Elizabeth. It is regularly used by Queen Elizabeth II when she is in residence at Windsor. Other notable buildings in the park include Cumberland Lodge, built in 1652 during the Commonwealth. After the restoration of the monarchy in 1660 the Lodge quickly became the home of the Ranger of the Great Park, an office in the gift of the sovereign. Each Ranger made his – or in one case, that of Sarah Churchill, Duchess of Marlborough, her – own mark on the features of the house and its surroundings. Throughout her life Queen Victoria was a frequent visitor. Her daughter Princess Helena of the United Kingdom lived at the Lodge for over fifty years, presiding over elaborate re-building after a bad fire in 1869 and extensive alterations in 1912. Lord FitzAlan, last British Viceroy of Ireland, was the last private person to be entrusted with the Lodge. It was in his time, in 1936, that the Prime Minister, Stanley Baldwin, discussed the crisis over King Edward VIII's desire to marry Wallis Simpson, talks which led to his abdication of the crown a few weeks later. In 1947, the King made the Lodge available to the newly established St. Catharine's Foundation, later known as the King George VI and Queen Elizabeth Foundation of St Catharine's. Today the organisation is simply known as Cumberland Lodge. Cumberland Lodge today is an educational charity dedicated to initiating fresh debate on the burning questions facing society. The grounds are not generally open to the public, but the house is continually holding conferences, open days and lectures. The private Cranbourne Tower is easily viewed from surrounding paths. It is all that survives of Cranbourne Lodge, the residence of the Keeper of Cranbourne Chase. It is thought to date back to the 16th century. In the south-east of the park, near Englefield Green, are the well-endowed Savill Garden and Valley Gardens which were designed and built by Eric Savill in the 1930s and 1940s. They include an extraordinary range of flowers and trees from around the world. Smith's Lawn and Polo Grounds are also nearby. The gardens are open to visitors between 10:00 and 16:30 in the winter and 10:00 and 18:00 in the summer. Virginia Water Lake, in the south of the park, is an artificially-created lake of around 1 km2 (0.4 sq mi) dating from the 1740s. Among the lakeside features are the 30-metre-high (100 ft) high Canadian totem pole, carved by Mungo Martin, Henry Hunt, and Tony Hunt Sr., commemorating the centenary of British Columbia and a collection of ornamental Roman ruins, transported from the site of Leptis Magna (modern-day Al-Khums) in 1816 and installed at Virginia Water in 1826. This tablet was inscribed by His Majesty King William the Fourth. It was originally inscribed "Culloden" but this was erased on Queen Victoria's orders and replaced with "Cumberland": "Cumberland" is inscribed within an inset in the masonry, the original surface having had "Culloden". Windsor Castle was begun in the 11th century by William the Conqueror as it afforded a good defensive point over the River Thames. A vast area of Windsor Forest to the south of the castle became reserved by the King for personal hunting and also to supply the castle with wood, deer, boar and fish. It was not until later that it became necessary to formally define this area. In 1129, the first parker was appointed, and in 1240, King Henry III officially set out the borders of the "Park", a region many times larger than the current Great Park. The castle was a mere fortress at this time and, when hunting, King Henry would have been resident at the more comfortable manor house of Old Windsor (what later became known as Manor Lodge). The title "Parker" exists today as "Ranger of the Park", the current title-holder being Prince Philip. Kings Edward I and Edward III used the park for jousts and tournaments and the latter had his Royal stud there to supply horses for the Hundred Years' War. The moat at Bear's Rails contained the manor house of Wychamere, the home of William of Wykeham while he was building the castle. It was later used for bear-baiting. Except for a brief period of privatisation by Oliver Cromwell implying subdivision to pay for the civil war, the area remained the personal property of the monarch until the reign of George III when control over all Crown lands was handed over to Parliament. Today the Park is owned and administered by the Crown Estate, a public body established by Act of Parliament in which the monarch and family members associated with its particular parts have non-executive, advisory roles. By the 18th century, the food value of the parkland to Windsor had decreased in importance and the new Hanoverian monarchs preferred to build and garden the land rather than hunt in it. The Long Walk had been laid out by King Charles II and the planting of its trees completed by William of Orange in the 1680s, with double rows of elms which lasted until World War II, but the Georges extended it and built numerous features and monuments, such as the Copper Horse (depicting George III) and the Obelisk (in honour of William, Duke of Cumberland). George III had a set of 2,000-year-old Roman ruins imported from Libya and placed in the park. Virginia Water was begun in 1746 by William, Duke of Cumberland who was then Ranger of the Park. Few details are recorded of the building of the lake; however it has been suggested that prisoners of war from the recent Jacobite risings, who were incamped at the nearby Breakheart hill, were involved. The original lake was much smaller than the current form, and was destroyed in a flood in 1768. In 1780, Paul and Thomas Sandby began construction of a much larger lake at the site, and went on to add an artificial waterfall, Meadow Pond and Obelisk Pond. The lake replaced a small stream of the same name which was probably named after Queen Elizabeth I, who was known as the "Virgin Queen". Queen Elizabeth II and Ronald Reagan riding on horseback in the grounds of Windsor Great Park during President Reagan's 1982 official visit to the United Kingdom. Queen Victoria was probably the greatest patron of the Park. Following the death of her beloved Albert, she largely withdrew from public life, retreating in part to the Park. At adjoining Frogmore she built a Royal Mausoleum for Albert. She was later buried there upon her own death, along with a number of other subsequent members of the royal family. During the World Wars, the Smith's Lawn area of the Park was used for housing troops. During the 1940s, much of the deer park was ploughed and farmed for food, which involved the felling of hundreds of ancient trees. Over 200 large bombs fell on the land, including several V-2 rockets. During the 1948 Summer Olympics, the park was used as the road cycling venue. In the 1950s, the Park was gradually turned into the recreation area open to the public that it is today. This involved the re-planting of Savill Gardens (which had been allowed to run wild during the war) and the new Valley Gardens. In 1951, a large wall for creeping plants was built at Savill using bricks from bombed-out London buildings. In 1958, a Totem pole was installed nearby, a gift from British Columbia to the Queen. In 1972 Ubi Dwyer organised the "People's Free Festival", the first of the Windsor Free Festivals in the Park, attended by 700 people. A co-organiser Sid Rawle claimed that Windsor Great Park has been common land until the 18th century, and inclosed (made private) by George III. Prince Philip, Duke of Edinburgh was reported to be "furious". Ubi and his allies repeated the festival in 1973 with at least 1,400 in attendance. In 1973, the Windsor Great Park regulations were introduced. In 1974, 7,000 people turned up but it was violently broken up by police, who made 220 arrests and the festival was banned. Dwyer was jailed the next year for distributing leaflets to promote another festival and Rawle was given three months for reproducing parts of Ubi's leaflets in the underground newspaper International Times. A new visitor centre designed by Glenn Howells Architects and Buro Happold was opened in June 2006, and was nominated for the 2007 Stirling Prize. If travelling by road with satellite navigation, use the address: Windsor Great Park, Windsor, SL4 2HT to enter via Rangers Gate, but bear in mind that access is strictly for authorised vehicles only. There are several other road, horse and foot entrances which may have a different post code, particularly the Long Walk entrance off the A308, SL4 2HH, some 1.05 mi (1.7 km) south of Windsor. If walking from Windsor, follow the A332 road south from Windsor for 1.86 mi (3 km). Access to some of the extensive "private" areas of the Great Park is available, on application, for an annual "key rental" fee of £20 (2011 price) plus deposit. Contact the Crown Estate Office, The Great Park, Windsor, Berkshire, SL4 2HT. Access to the park is governed by Windsor Great Park Regulations 1973 S.I. 1973/1113, displayed on boards at most entrances. However, in March 2016, Prince Andrew ignored these rules and tried to gain access to the park by ramming the gates in his car. Every five or six years since 1993 Windsor Great Park has been home to the Scout and Girlguiding camp WINGS (Windsor International Guides and Scouts camp), last held in August 2014. Windsor Great Park was featured on the cover and inner booklet of the 1978 Elton John album A Single Man. The Crown Estate has allowed the use of the Park as a filming location and the Great Park has been used on Harry Potter and the Half Blood Prince, Harry Potter and the Deathly Hallows (Parts 1 and 2), Pirates of the Caribbean, Sir Ridley Scott's Robin Hood, and Snow White and the Huntsman. In 2014 the Park was used as a location for Into the Woods. The King's Speech made extensive use of Cumberland Lodge. King Arthur: Legend of the Sword was on location in the South Forest in early 2015; The Huntsman: Winter's War used various locations during May and June 2015; Bridget Jones's Baby was filming on location on Duke's Lane in October 2015, "Flowers" from Channel 4 was filming in December 2015 in South Forest & Penslade Bottom, and Windsor Great Park "Friends and Members News" Summer 2015 edition refers to the filming of the 2016 Warner Bros. film, The Legend of Tarzan, and the 2015 Disney film Cinderella. It has doubled as Scottish lochside forests, the River Thames (Robin Hood, 2010, Virginia Water), and the slopes of Mount Fuji. The Great Park has also been seen on Countryfile and Midsomer Murders. In April 2016, scenes from the film Annihilation were shot in South Forest, and in June 2018 The Voyage of Doctor Dolittle was location filming there also, and Disney filming with huge lighting cranes at Temple Hill. Virginia Water, Englefield Green and Runnymede, adjacent to the River Thames and with Air Forces Memorial and John F Kennedy memorial. ^ "Windsor Great Park". Thecrownestate.co.uk. Retrieved 7 June 2017. ^ a b "Opening times and charges". The Crown Estate. Retrieved 16 April 2016. ^ "Designated Sites View: Windsor Forest and Great Park". Sites of Special Scientific Interest. Natural England. Retrieved 21 November 2018. 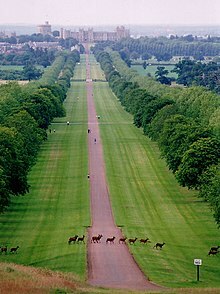 ^ "The Long Walk, Windsor Great Park - Information pictures and history - The Royal Windsor Web Site by Thamesweb". Thamesweb.co.uk. 28 December 2000. Retrieved 7 June 2017. ^ Caroline Davies. "Princes return to a family in grief". The Daily Telegraph. Retrieved 6 December 2013. ^ Fielder, Andrew (1 May 2010). Windsor Great Park: A Visitor's Guide. Copperhorse Publishing. p. 28. ISBN 978-0-9564703-0-0. ^ "1948 Summer Olympics official report" (PDF). La84foundation.org. pp. 43–4. Retrieved 8 June 2017. ^ Siobhan Fenton. "Prince Andrew reported to police by campaigners 'for ramming car into Windsor Great Park gates'". The Independent. Retrieved 7 June 2017. ^ "Wings 2014 Homepage". Wings2014.org.uk. Retrieved 8 June 2017. ^ "News from The Royal Landscape" booklet, Winter 2013, published by the Crown Estate.